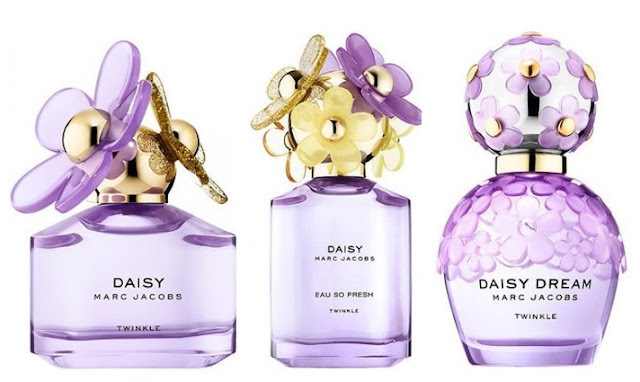 Marc Jacobs Daisy Twinkle Editions are a sparkling, vibrant violet twist on the original trio - inspired by a shimmering oasis where the sun dazzles and water glistens. Daisy Twinkle Edition - 50ml EDT - $96 - an uplifting bouquet of floral and fruity notes with a top note of juicy berries; heart note of violet flower; and base note of white woods. Daisy Eau So Fresh Twinkle Edition - 75ml EDT - $108 - radiates with an effervescent blend of succulent fruity and delicate floral notes with a top note of sparkling raspberry; heart notes of violet flower and wild rose blossoms; and base note of creme de cassis. Daisy Dream Twinkle Edition - 50ml EDT - $96 - an airy blend of lush florals and juicy fruits with a top note of black cherry; heart note of fresh white florals; and base note of whipped berry mousse. which seriously makes me smell good enough to eat! 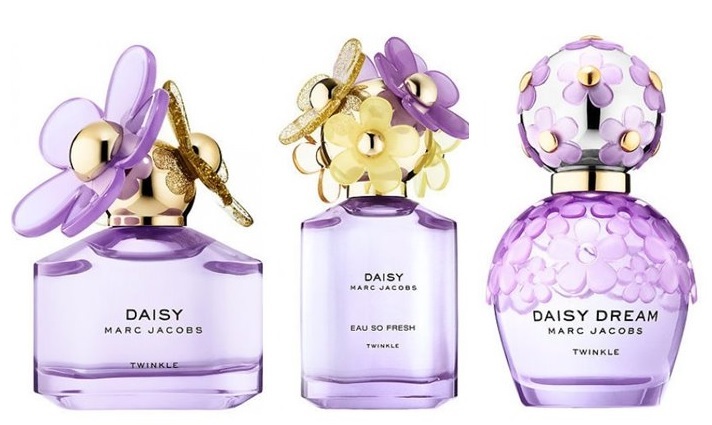 The bottles were inspired by Marc Jacobs' unique use of layering, colour and his love of shine in a soft violet hue and touches of gold to evoke the feeling of an endless summer where sunshine makes everything twinkle - and of course the flowery caps are what happiness is made of! Available now at Hudson's Bay, Shoppers Drug Mart, Sephora and Jean Coutu stores across Canada.